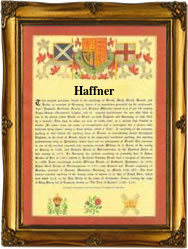 Recorded in several spellings including Hafner, Haffner, Hefner and Hevner, this is as surname of early Germanic origins. It derives from the pre 7th century occupational word 'hafner'; which described a maker of pottery, particularly earthenware bowls and pitchers of a large size, used for the transport of liquids by pack animals. Locational surnames, although amongst the first to be created in the medieval period from about the 12th century a.d., only became hereditary if a son or sometimes a grandson, followed the father into the same line of business. Many did not, and these people would or could then be known by both the fathers occupational name and their own! Perhaps not surprisingly given the importance of the product, this surname has produced one of the earliest of all known German surname recordings as no doubt the manufacture of such required items as bowls, would have created its own need for identification. This first recording is that of Hugo Hafnare, a burger of Konstanz in the year 1158, whilst a century later we have the recording of another Hugo, this time Hugo Hevner or Hevener, of Bellheim in Pfalz, in the records of that town in 1275.